Want slots online to add some serious spice to your slot game play? Well, there’s plenty to go around in the Chili Heat game! Brought to you by the gang at Novomatic, this Central American slot will certainly get you doing the Mexican wave in no time at all! So, when you are ready to make things hot, hot, hot, sit back and start betting on the reels – you might be surprised at how spicy the winnings are here! Discover online casino slot games like this one! 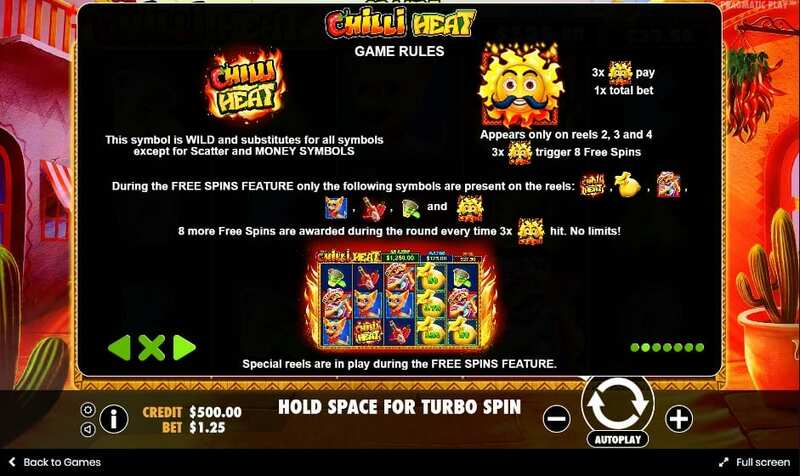 Chili Heat has been created by Novomatic, an international team of developers who are known for their unbeatable work ethic and innovative ideas. The company goes way back to 1980 when it was originally founded and quickly became the largest manufacturer of gaming machines. Now it is enjoying its reputation as being one of the best casino slot developers out there at the minute and continues to go from strength to strength. Try your luck at their other games, such as 7s Gold Casino. As soon as the game screen loads, you will notice that you’ve been brought to a traditional Mexican town. There are a few palm trees next to what looks like a Mexican villa in the background. You don’t get to see much of this scene, though as the game’s five reels stand before it and take up most of the screen. But that shouldn’t bother you too much as there are an amazing fifty pay lines for you to win on in this slot game! Go over this guide to help you pick the best slots games with high RTPs. One the game reels, you will notice a host of different symbols. And they are as Mexican as you would expect them to be! That’s all except the letters and numbers, though, as they are the icons with the lowest values. They’re still bright and cheerful, though, it’s just they won’t win you as much cash as the picture symbols. You’ll spot pairs of maracas, trumpets and a pretty senorita. Your whole aim is to try and match up these picture symbols along the pay lines. That way, you’ll bag yourself some great pay-outs! There are also some bonus symbols that can help you increase your winnings as well. 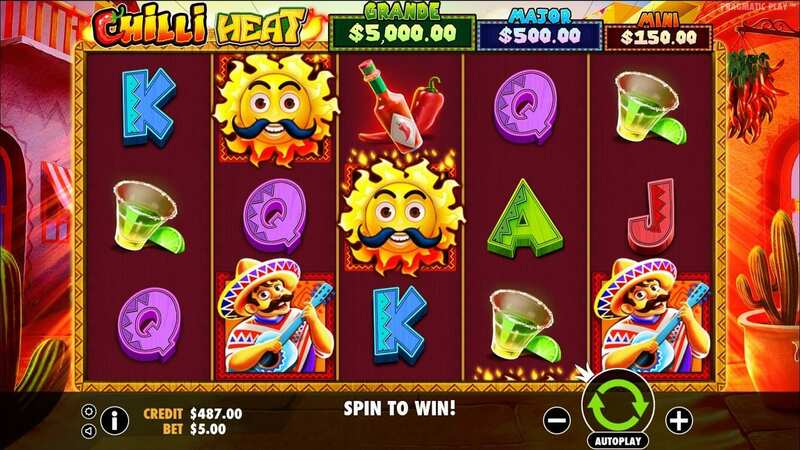 WILD SYMBOL – Almost ever slot game out there has a Wild symbol and Chili Heat is no different. It’s the Mexican man who looks like he’s part of a mariachi band. He can replace all of the symbols (apart from the Scatter) to help increase your winnings. SCATTER SYMBOL – The fiery chili is the game’s Scatter symbol. If you manage to spin at least three of these on the board, you will win a very generous fifteen free spins. As far as Mexican-inspired games go, Chili Heat is one of the most thrilling ones. The bonus features crop up quite regularly which means that players stand to win some very substantial jackpots. Its quick gameplay will certainly keep you on your toes, and you will find that all of the authentic Mexican graphics add a lot of authenticity to this slot. If you enjoyed Chilli Heat why not try Diamond Strike.